Guests at Hotel Sant Roc can not only enjoy an impressive view of the bays of Calella de Palafrugell from their terrace or stroll through the shady garden, but they can also enjoy direct access to the sea from the hotel. Or admire unbeatable views from the panoramic restaurant. 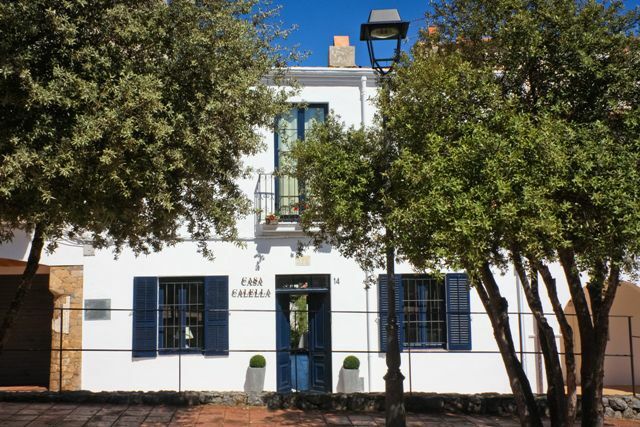 Just 200 metres from Calella de Palafrugell and 30 minutes from five golf courses, the Serra family run a welcoming hotel, the Garbí. A hotel where guests can swim in the heated swimming pool in the garden or relax in the jacuzzi in their room. And where they can enjoy refined Mediterranean cuisine. The Hotel Alga is located on the main street of Calella de Palafrugell, 200 metres from the beach, and has 59 rooms and various function suites which can hold up to 300 people, as well as over 7,000 m2 of gardens, 2 swimming pools, a tennis court and car park. It also offers room service, buffet breakfasts, a bar, laundry, and a fax service. Casa Calella is an accommodation located in the old centre of Calella de Palafrugell, Baix Emporda’s most beautiful costal town. It is next to the church, a few meters away from the sea. The 19th century house is restored fully, keeping its original atmosphere, with all the modern comforts. It also has a cheerful 170m2 garden where you can relax, read, or have a drink. On the terrace under the lemon tree we serve our breakfast. Casa Calella is an exclusive place to enjoy a pleasant stay in a unique area. If you do not have an account, you can create a click here.